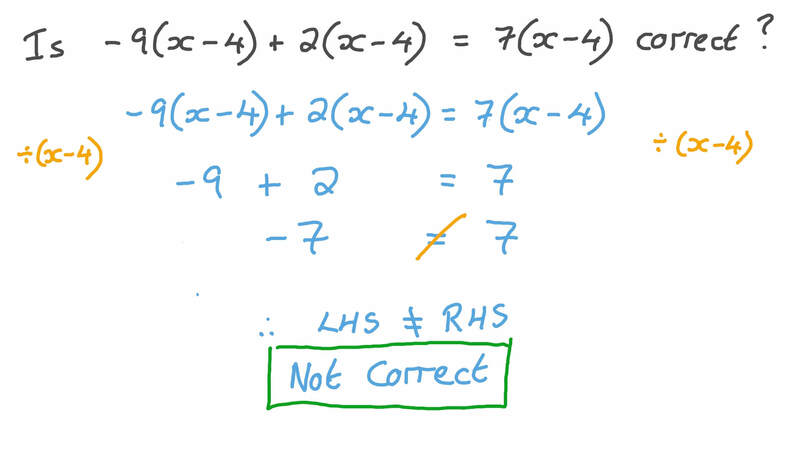 In this lesson, we will learn how to correctly simplify algebraic expressions by combining like terms and simplify expressions containing negative numbers and fractions. Is − 9 ( 𝑥 − 4 ) + 2 ( 𝑥 − 4 ) = 7 ( 𝑥 − 4 ) correct? Simplify − 3 𝑥 𝑦 − 2 𝑥 𝑦 + 3 𝑥 𝑦 − 2 𝑥 𝑦 + 8 𝑥 𝑦 + 8 𝑥 𝑦 2 3 2 3 5 2 2 5 . Simplify   × 9 × 6 √ 3 ×   1 4 1 − 𝑚 𝑚 − 1 4 − 𝑚 𝑚 + 8 𝑚 1 8 𝑚 2 − 1 − 𝑚 3 . Simplify 6 × 9 ×  √ 6  1 8 × 5 4 𝑛 𝑛 + 2 2 𝑛 .
Simplify the expression 1 6 𝑥 + 2 6 𝑥 + 5 6 𝑥 .
Simplify the expression 1 1 1 𝑥 + 3 1 0 𝑦 + 7 1 1 𝑥 + 1 1 0 𝑦 .
Simplify the expression 3 𝑥 + ( − 2 𝑦 ) − ( − 3 𝑥 ) + 8 𝑥 − ( − 4 𝑦 ) + 3 𝑦 − ( − 2 𝑦 ) . Simplify the expression 3 8 𝑥 + 5 8 𝑦 − 1 4 𝑥 − 1 4 𝑦 .
Simplify 𝑥 + 𝑥 + 𝑥 + 𝑥 + 𝑥 + 𝑥 + 𝑥 .
Simplify the expression 1 2 𝑥 − 3 𝑦 − 4 𝑥 − 4 𝑥 + 1 2 𝑦 − 2 𝑥 + 8 𝑥 2 2 2 . Simplify the expression 4 𝑥 + 3 𝑥 − 2 𝑥 .
Simplify the expression 3 1 1 𝑥 −  − 1 1 1 𝑥  +  − 3 1 1 𝑥  −  − 1 1 1 𝑥  . Simplify the expression 3 4 𝑥 + 2 3 𝑦 + 2 5 𝑧 − 1 5 𝑥 − 5 8 𝑧 + 4 5 𝑧 − 3 4 𝑦 .
Simplify 7 × ( − 1 ) × 𝑏 .
Simplify the expression − 5 9 𝑥 − 4 9 𝑥 − 2 9 𝑥 − 8 9 𝑥 .
Simplify the expression 3 𝑥 + ( − 2 𝑥 ) − ( − 3 𝑥 ) + 8 𝑥 .
Simplify 1 −  1 6 𝑏 + 9  2 . Simplify the expression 1 2 𝑥 − 3 𝑦 − 4 𝑥 − 4 𝑦 + 1 2 𝑧 − 2 𝑦 + 8 𝑧 .
Simplify the expression 3 𝑥 + 3 𝑥 + 9 𝑥 + 7 𝑥 .
Simplify the expression − 2 3 𝑥 − 3 4 𝑥 − 5 6 𝑥 − 4 1 0 𝑥 .
Simplify the expression 3 1 0 𝑥 − 4 1 0 𝑥 + 2 1 0 𝑥 − 1 1 0 𝑥 .
Simplify the expression 3 8 𝑥 + 3 4 𝑥 − 1 2 𝑥 − 1 8 𝑥 .
Simplify the expression − 1 1 0 𝑥 − 2 5 𝑥 − 1 2 𝑥 − 7 1 0 𝑥 .
Simplify the expression 1 3 𝑥 + 3 5 𝑥 + 9 4 𝑥 + 1 2 𝑥 . In the following diagram, 𝑏 is the quantity of water in a full bottle and 𝑔 is that in a full glass. The total quantity of water shown in the diagram can be expressed as 𝑏 + 𝑔 + 𝑔 + 1 2 𝑏 + 3 4 𝑏 . Simplify this expression.